Zoë MacDonald is E-Commerce and Social Media Manager at Canada’s largest manufacturer and wholesale distributor of quality sewing, quilting, and knitting supplies. 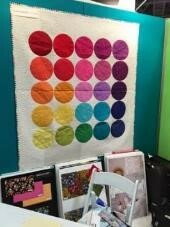 Crafty lady and recent quilting convert, she is keen to share her love for the latest in notions. After all, when you are addicted to the fresh start of a new sewing project, armed with crisp new fabric and purpose, getting to completion can be its own challenge. 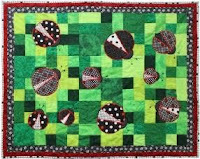 Most of my UFOs aren’t quilting projects, but I imagine there is a quilting equivalent to being up late, surrounded by pleated and gathered mint chiffon, wondering where it all went wrong. This is especially true for those of us who are prone to distraction, or “easily inspired”. All this to say, I’ve learned (the slow way) that it pays to keep it simple and focus on one (maybe two) striking features that you know you can nail. So, I pressed on, and in my quest for quiltsperation I noticed a common theme among many bold modern quilts: circles. 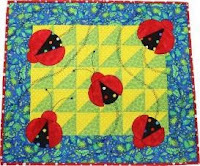 Either in ascending order or polka dot grid, layered like a Venn diagram, or integrated into pictorial motifs (ladybugs, flowers, etc. ), They. Were. Everywhere. Works in progress – as seen on Jackie’s Art Quilts Blog here. … and suddenly, it occurred to me that I can do this! Or, at least some version of this, thanks to my secret weapon: the TrueCut Circle Cutter. 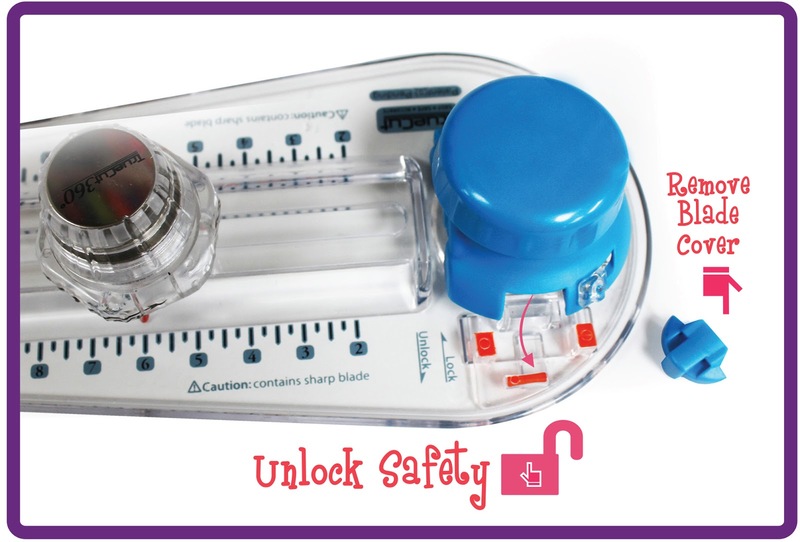 Unlock the gear (lefty loosey) then lock again (righty tighty) when the red indicator is pointed at the correct measurement. 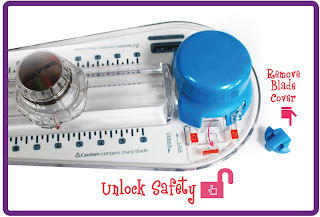 Unlock safety near blue blade “button”, and make sure blade cover is removed. Place circle cutter with blue button facing you: Remember, “Blue to belly”. Press down on gear shape on what will be the centre of your circle, with your non dominant hand and dominant hand over this arm and on the blue button. Then, apply pressure, swooping the cutter around the centre gear for a full 360 degree turn. 2. Use TrueCut Circle Cutter to cut both circles. 3. Match adhesive side of interfacing with right side of fabric circle. Sew along edge with ¼” seam allowance (6 mm). 4. Use pinking shears around seam allowance to notch fabric and reduce bulk at the same time before turning. 5. To turn, cut a slit in interfacing side and reverse appliqué circle through this opening. To help ensure a smooth edge, use an Heirloom Crease Marker and/or Fabric Folding Pen along the seam. I fused the sun and planets in place over the scattered sky-themed half-square-triangle quilt base, using wool heat setting. I used the turned edge appliqué technique to allow for a simple straight-stitch with Sulky Holoshimmer to secure in place, and stippled the “orbit lines” with the same thread combination. While I took some liberties with scientific fact, you get the idea. Aside from playing fast and loose with the size scaling, you’ll find technically-not-a-planet Pluto peeking in from the opposite corner. It’ll always be an honorary planet to me! A good outlet for scrap batting. Don't forget to use Unique Therm Fleece! What would you make if you knew cutting circles was this easy? For a chance to win, submit your comment by Friday, November 6th at 4pm. Canadian residents only. Update: This draw is now closed. Congratulations to winner Laura! To purchase your own TrueCut Circle Cutter, visit your local Canadian quilt retailer. For more inspiration and product education, follow H.A. Kidd and Company Limited on Facebook. I would make A baby quilt with perfect inset circle. No more using plates. 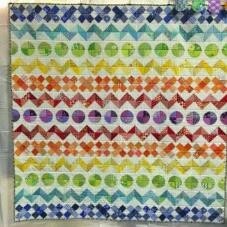 I always wanted to make a fun wall quilt using circles but how to cut out different sized circles? 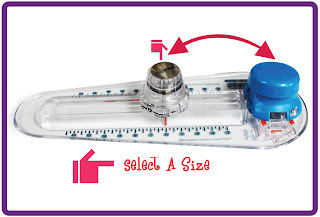 What a great tool! Always looking for ways to make quilting fun and easier. It's time to move from squares and rectangles into the "round realm". Using plates and glasses and cans are now delegated to the past... And I've always wanted to make those rummy-looking donut pincushions. Thanks for the "new"ideas... 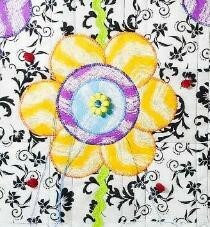 I like to bring gifts to quilters when I travel and this one is fab! I would be interested in making a modern quilt representing bubbles, either the kind found in water or those made with bubble wands loose in the air. Wow, what a great circle cutter tool. Much easier than freezer paper templates and so accurate. I do love a circle theme and the first thing I'd try is a modern quilt with some inset circles and some appliqued circles in various sizes. Would be fun to quilt both the circles and the background. CONGRATULATIONS, Laura! You have been randomly selected as the winner of the TrueCut Circle Cutter! Send me an email at socialmedia@hakidd.com with your address, and I will send your prize! That looks like a fabulous circle cutter. Circles have always been a challenge, maybe that tool would take the challenge away and let me play! So many things that I could use a circle cutter for. Yeaaaaaa! I would make a circle jean's quilt. This would be great for cathedral window! An antique looking orange peel quilt. So many patterns I've ignored , I'd have to have a 2nd look at with that tool. Thanks for the opportunity to win it. Would love to try this cutter. 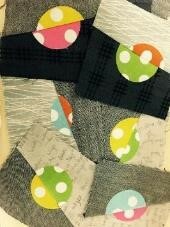 Have a few projects that involve circles of different sizes. As Mr. Bond would say..."diamonds are forever"
One of the Best Jokes on the Board!